To celebrate the upcoming release of my third novel, Driving in Neutral—a love story about claustrophobia—I am running the 75 Days of Phobia series. As Olivia, the heroine in Driving in Neutral says to Maxwell the claustrophobe, “Everyone’s afraid of something.” While this is true, it seems Author Ebony McKenna may have conquered one of her fears. Showoff. Not another author admitting to Arachnophobia, a phobia about spiders! Yeah, guilty as charged. But I’m also sharing a dramatic personal journey about how I forced myself to get over them. There’s nothing wrong with being afraid of spiders. They have evolved to look like they’ve come from the very bowels of hell. 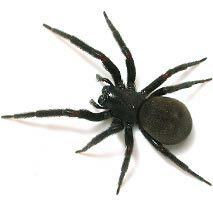 They bite, sometimes with venom; they’re sneaky and make enormous webs that get in our hair; they also love to hide in the car and leap out when we flick the sun visor down. This suburban cliché did happen to me. I did my best not to freak out, but the people in the car beside me lost their minds! Growing up in country Victoria, spiders were part of life. The woodpile was always a source of spider terror, so I’d routinely roll the logs off the pile with a rake and kick them a few times before bringing them in. Then I’d sit by the fire and watch the black house spiders crawl out from those same logs of wood, into the flames of hell. My cat was the first of my rescuers. She had a litter of kittens in the corner of my bedroom, and one morning a freaking enormous huntsman sauntered across the floor. Like he owned the place. Before I could grab my shoe, the cat padded over, whacked the thing flat into the ground, then proceeded to eat it. The whole thing. Not even a hairy leg left. That cat was either starving hungry, or protecting her babies. Either way, she was really freaking awesome. I found red back spiders in my compost heap next to the veggie patch. I lifted the lid to chuck in the leftovers and there they were, calm as you effing well like, with a huge sack of eggs behind them. A ciggie lighter and a can of fly-spray from the kitchen made a brilliant napalm fire-spray. Sure, it melted the compost bin lid, but in any war there’s bound to be collateral damage. But there are only so many houses I could burn down before I had to admit I had a problem. A good and proper phobia of spiders. Plus, by this stage I was living in a share house so I had to harden up and look after myself instead of relying on another person, or cat, to deal with my issues. Plus, at some point (I’m not entirely sure) I kind of grew up. In those halcyon days when people read blogs, I wrote for a fake-news/satire site. I had to fill it with content! Every week! I know! One of those pieces of spak-filla content was about the numerous Australian creatures just sitting around waiting to kill unwary tourists. 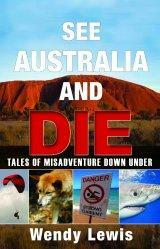 Crocodiles, irukandji jellyfish, blue-ringed octopus, stonefish, sharks, dingoes, drop bears and spiders. Reading about these creatures, I learned that red-backs, while famous for hiding on toilet seats, weren’t that lethal. Sure, the bite itself is so painful you’ll wish you were dead, but you won’t die. Just recently, hospitals have found most spider bite cases don’t require antivenom. Just painkillers (yes please!) and loads of ice packed around the wound to numb the pain. Hmmmm, I thought. Not instantly dead eh? That’s a plus. The more I read about our arachnid friends, the more I realised how incredibly helpful spiders are. They keep the bug, fly and mosquito numbers down in the garden. They in turn become bird (and presumably cat) food, thus continuing the circle of life. Spiders also show us that we can become instant ninjas when we walk into one of their webs. How cool is that? There are still some species that are very dangerous, like the Sydney Funnelweb (Thank goodness I live in Melbourne), but I believe most species are seriously misunderstood. These days, when I see a spider, I don’t immediately kill it. I do the ‘jar over the top, slide a piece of cardboard underneath’ trick and take them outside. Then, when it’s all over, I have a private little freak out and get back to work. So now it’s your turn. Can you find it in your heart to love a spider? OK, what about a little picture of one instead? PS. There are no spiders in my Ondine novels, but there is a talking ferret and copious footnotes. $4.99 on the ibookstore. Bargain! Some of the stories in that book are pretty AIIIIIEEEEE! As I keep saying, Australia wants to kill you. Especially if you are a tourist. Now I’ll have to get a copy of Wendy Lewis’s book. It looks brilliant!